This book is a short and easy to read book with what is often otherwise complex content and terminology. Bookbinder presents a wide scope of examples and context around the idea of using empathic communication (primarily listening) as well as acknowledging during conversations to help the reader better connect and understand how to show interest in relationships. The book jumps between numerous examples, some repeated, to highlight different aspects of conversation that teach how to bring more empathic (the same thing as empathetic) listening into common situations. People are so often focused (even in private conversation), on what they want to say in the conversation, it is common for neither party to ever really hear what the other is saying and even more rare that they connect and engage on the “important” portions of a conversation. 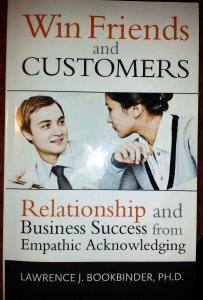 The techniques in this book help to demonstrate that and give methods and subtleties that can be practiced to change that and be more empathetic in conversation with others. The acknowledging focus then in the book is essentially recognizing and repeating what another person is actually saying and a more advanced version of that, is to interpret some feeling or meaning from that that connects with the person sharing the information. This is again a conversation technique and can be used while listening to confirm what has been heard, or to connect and engage the other on what or how it has impacted them, if that can be determined. The author describes many advantages and disadvantages of each of these techniques and provides some great insight as to when to use them or when to refrain. I thought these guides were quite refreshing and helped to lay a better context around when these tools should actually be used, as obviously they do not always make sense. I enjoy reading books on different communication techniques or tools and this book was an easy read, quick to understand and I think one that will be very useful to me as I actually now do some practice with these methods to see where I can better connect and engage others in not just any conversation, but meaningful conversation. One thing I found very odd about the book, was how much content is in the appendixes and how some of them are written. They describe the book, they outline why you should read it and they seem to go into great detail to convince you to read it, almost to a defensive stance, which I could understand this on the cover, on the preface, but not in the appendixes. I, like most people read the book from start to finish and so reading these aspects in the appendixes after reading the book, made me question what I had just read, since it seemed like the author was defending the book and perhaps even himself, despite any reason or challenge to do so. I found that quite odd and not something I’ve seen before in a book. If you do pick this up, I’d recommend starting in the appendixes and then reading the main book afterwards. Prev: How and what are you learning lately?